Thanks everyone who asked a question. Sorry I couldn’t answer them all. 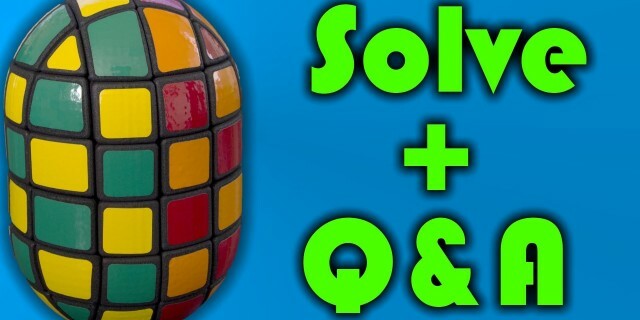 In this video I solve the CrazyPill by CrazyBadCuber while answering questions you asked on facebook. My solution is probably a bit different then how many others would solve. It’s not very efficient but you don’t need to worry about remembering color orientations. For step 1 you don’t need to worry about the sticker orientation. You just need to find the tall centers and put them next to each other. Step 4 just requires 3×3 super cube algs. For step 6 I first pair a single outer edge pair using intuition. Putting the solved edge pair in the BD position I use this alg: r U2 r’ U2 to cycle the other outer edges. Then I use the 4×4 edge flipping parity algorithm either once or twice to finish the edges. Step 7 is just like Step 6 except for it’s the inner middle layer edges.